Everyone has waited along time for it, and here it is. The Remote tuning module from WMW. People always want one of our custom ECU tunes, but being far away from our shop it has always been hard to do. But now we have our remote my genius module. 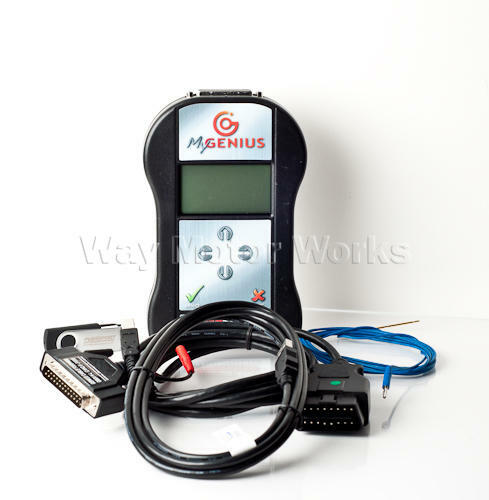 After you purchase the module and recieve it, you will plug it into your car and download your stock ECU file. Then using the cable provided you will upload it to your computer and email it to WMW. Once we receive it we will modify it and email it back. Then you tranfer it onto the module. Then just simply connect the module and load it onto your car. If your wanting to go furthur than just an ECU flash, you can take your car to the dyno and send the dyno graphs and A/F graph to us, and we can then exchange several files while dynoing to gain you the most power and torque. Maps we can adjust include Timing, fuel, injection, torque, throttle, rpm limiter, boost maps. Tune from Way will have to be purchased seperately by calling.